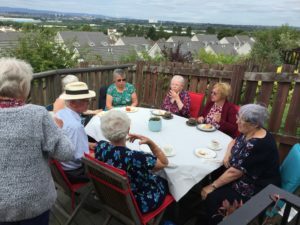 On Saturday 21st July two members of Rutherglen URC, Jan and David Pickering, hosted a Strawberry Tea in their garden at their home in Cambuslang. 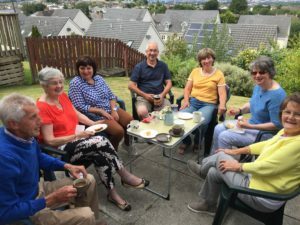 This event was a fundraiser which was organised in response to a challenge that was issued by members of the URC Youth Forum at the Synod meeting in March to all URC Churches in Scotland that each local church should organise a fundraiser to raise funds in support of a charity that seeks to tackle homelessness. This could be a local or a national charity. Jan and David, supported by members of the JOY Group (Sunday morning youth group), organised the fundraising event which was attended by over 20 members and friends of Rutherglen URC. In all £625 was raised for the Simon Community – a charity that works with people who are homeless. Thanks to Jan and David Pickering for hosting this event and to Hannah and Morven Sanderson helping with the organisation. Has your Church risen to the challenge? If so please e-mail details to Revd Andy Braunston for the SynNews, Matsi Dickie for the ENews and Revd Alan McGougan to go on the website.